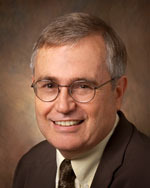 Al Cross is director of the Institute for Rural Journalism and Community Issues, based at the University of Kentucky, and an assistant professor in UK’s School of Journalism and Telecommunications. He was an editor and manager of weekly newspapers before reporting for The Courier-Journal for 26 years, the last 15½ as chief political writer. He writes a fortnightly political column for the Louisville newspaper. He was president of the Society of Professional Journalists in 2001-02, and is a director of SPJ’s Sigma Delta Chi Foundation. His awards include a share of the Pulitzer Prize won by the C-J staff for general news in 1989, for coverage of the nation’s deadliest bus and drunk-driving crash. He has been a contributor to several books and journal articles on rural journalism, Kentucky and politics. He grew up in Albany, Ky., and is a graduate of Western Kentucky University. Al Cross, director of the Institute for Rural Journalism and Community Issues, explains that community newspapers weathered the 2009 recession better than their big-city, large-metro newspaper cousins. Cross says that the digital revolution has not completely penetrated the smaller newspaper world, but that he expects that they will have to participate with websites, particularly as the use of mobile, smart-phone news distribution grows.